Google Ads (formerly “AdWords”) has always had a notorious reputation for questionable success. In short, not all advertisers can turn a health ROI with Google Ads. But not all advertisers are fully aware of why they’re seeing clicks but little-to-no conversions. The fact of the matter is, there are a lot of ways you can make mistakes with Google Ads. Unless you’re aware of certain features and nuances with this PPC platform, you can burn through your budget rather quickly without much to show for it. So in this post, we highlight 5 very important Google Ads tips to help you avoid costly mistakes and get the most return on your ad spend. While this might seem like an obvious tip for more experience Google advertisers, it’s an important one. Upon creating a new campaign, or found under “Settings” when in campaign view, you’ll see an option for “Networks.” This is essentially where you ads will be shown. By default, you will be prompted to “expand your reach” by including the Display Network along with the Search Network. While this might seem like an attractive option that could maximize your ads’ visibility, in reality it is a waste of money. If you did choose to include the Display Network, your expanded text ads (Search Ads) will appear on other websites in the Google’s Display Network. Because display ads typically perform best as visual graphics, such as banner ads and side column ads, text ads (which should be reserved exclusively for the Search Network) will more than likely perform very poorly and cause inefficiencies across your entire campaign. For this reason, it’s always best to create Display campaigns separately, and use visual graphics that speak to your target audience (not expanded text ads intended for Search users). The bidding strategy you choose (also found under “Settings” when in campaign view) will greatly impact how well your ads perform. Google makes it very easy to pick a bidding strategy, but without understanding the nature of your chosen bidding strategy, you can burn through your budget rather quickly. It’s important to note that by default, Google will pre-select an “automated” bidding strategy for you campaigns. While each of these strategies serves a purpose, most of them will compromise your control over how much you’re spending per click. The first thing to point out is that top 7 of 8 bidding strategy options (shown above) are automated. With these strategies, Google to adjust your keywords’ Max. CPC automatically. For larger campaigns that have a high volume of ad groups, some of these options might make sense using, such Enhanced CPC or Maximize Conversions. But keep in mind, you’re ads need to be seeing a significant volume of activity for these bidding strategies to work properly. Most Google Ads experts will advise using these automated options sparingly or with strategic intention. For more conservative advertisers or smaller accounts, it can be beneficial to use Manual CPC bidding. Although you’ll get a warning message as shown in the figure below, using this approach will give you more control over your bids and where your money is going. A common mistake that can result in a lot of wasted ad spend is using only broad match bidding for your keywords. Unfortunately, the nature of broad match is very, very… broad. Without using more precise match types, like exact, phrase, broad match modifier, we are opening the door to potentially unwanted impressions and wasted clicks. For advertisers who have a limited budget, broad match can expend your daily budget rather quickly with little to no return. Most Google Ads consultants will advise using a combination of more precise match types. This will ensure that you’re ads are being triggered by the appropriate queries that align with what you’re offering. In September of 2018, Google unveiled a new format to its expanded text ads. Instead of just two headlines and one description line (80 character max), now advertisers can leverage a third headline and a second description line (which are now 90 character max). 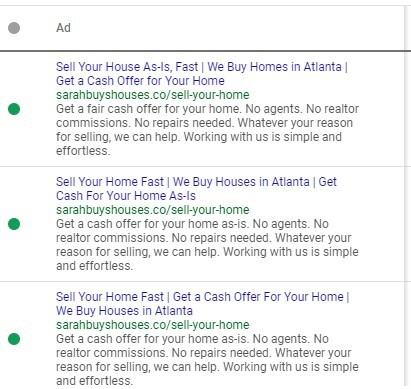 Not only does this new feature allow you to maximize the real estate of your ads in the search results, but it also offer greater creative leeway for ongoing split-testing. See the example below of this new format and how we’re using all fields to their fullest potential. If you’re more of a creative marketer, then you’ll likely find enjoyment writing Search Ads in this new format. However, if you’re more analytical with Google Ads, good ad copywriting practices can be learned. There are many online PPC courses that provide excellent insights on how to become a proficient ad copywriter. But beyond just writing ad creative, you should also split-test different concepts over time. Test subtle changes to your ads, like different headlines to start. Ads with too great of variation will be difficult to track what’s actually working and what’s not. Make use of verbs and value propositions to entice users. 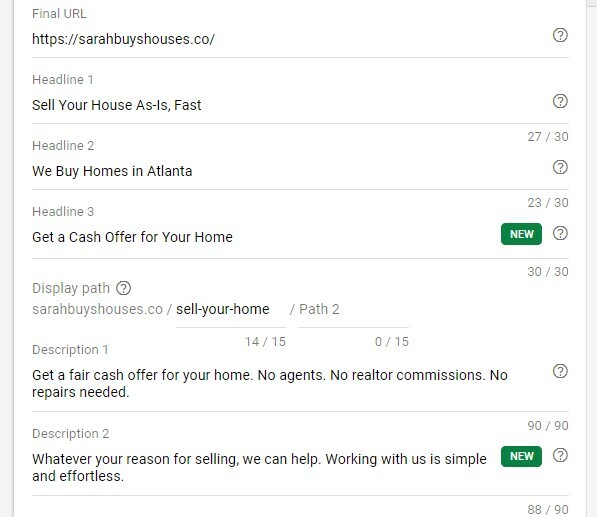 Notice how the ads above use “Sell Your Home Fast” and “Get a Cash Offer” – two things that mean the most to our target audience. As a result of good split-testing, you can help boost your creative excellence score (a measurement Google uses to define Ad Rank) and continuously improve your ads for better click-through rates. In turn, you can maximize your ads’ performance, which can translate to higher keyword quality scores and cheaper clicks over time. This Google Ads tips is especially critical if you’re using any form of broad or phrase match bidding. Because using broad and phrase match open the door to potentially unwanted keyword variations, it’s important to add these as negatives to prevent your ads from showing. In the example below, the advertiser is looking to buy homes and only homes. So to ensure her ads only show for such queries, we will employ certain negative keywords that could warrant unwanted impressions. Per the example above, a common variation to her target keyword is “sell my home timeshare,” which is not what she’s looking for. By adding “timeshare” as a negative keyword, we can prevent her ads from showing for such variations. 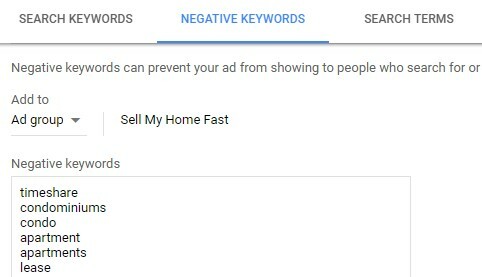 You can find negative keywords by using the Google’s Keyword Planner, Predictive Search (or autocomplete), or other keyword research tools. If you’re campaign has been active for awhile, you can also view the Search Terms for a given campaign or ad group, and see if there’s any unwanted queries causing your ads to trigger. In which case, you can add these as negatives to prevent future occurrences.